It was an eerie throwback to the Cold War. On April 4, 1997, a Russian cargo ship spying on the USS Ohio off Washington’s Puget Sound fired a laser beam at a Canadian helicopter. The new Russia was relying on an old Soviet tactic — trawlers known as AGIs for Auxiliary General Intelligence. When the Cold War supposedly ended in 1991, the U.S. Submarine Force numbered 61,000 sailors, 34 missile subs and 89 attack subs. “The U.S. and Soviet Union had fought a vast, undeclared and sometimes chillingly violent Cold War under the sea,” wrote Chris Drew and Michael Millenson in the Chicago Tribune. Movies like The Hunt for Red October brought that war home to unsuspecting Americans, but few knew how real the deep-sea struggle actually was. The undersea conflict was waged beneath the ice floes of the North Atlantic, in the shallow waters of the Mediterranean and through the deepest canyons of the Pacific. It was carried on under the Arctic ice cap where U.S. attack subs stalked Soviet ballistic missile subs. It reached the coastlines of the U.S. and Soviet Union. Submarines sometimes snuck into harbors or lurked as they waited to shadow an adversary’s boat. On the seafloor both sides positioned sophisticated listening devices. The more advanced U.S. system, called Sound Surveillance System (SOSUS), consisted of strings of hydrophones planted at strategic spots on ocean bottoms. SOSUS was so sensitive that the Navy tracked Soviet subs thousands of miles from U.S. shores. The undersea Cold War began not long after WWII as hostility increased between the U.S. and Soviet Union. The Navy’s subs were nothing more than upgraded WWII “Pigboats” — their speed was as minimal as was their diving depth. As the Cold War intensified, the design and propulsion systems of U.S. subs changed radically. First came the nuclear sub, USS Nautilus, in 1954. Nuclear power was combined with a hydrodynamic, cigar-shaped hull design that revolutionized submarine warfare. American subs now cruised for months at depths of hundreds of feet at speeds sometimes faster than surface vessels. In 1960, the U.S. revolutionized warfare by introducing “boomers,” guided missile subs (SSBNs) that replaced cruise missile boats (SSGNs). The first of the SSBNs, the George Washington, was a Skipjack class sub converted to carry 16 Polaris missiles. It was followed by the improved Lafayette class of Poseidon missile boats. The Ohio class subs, with Trident missiles, are reputed to be the quietest subs to ever go to sea. U.S. attack subs (SSNs) combined speed with quiet running. They were assigned to defend carrier battle groups, maintain the nation’s sea lanes and to target Soviet SSBNs and attack subs. Skipjack, Permit and Sturgeon classes of the 1960s and 1970s were followed by the Los Angeles class subs of the 1980s-90s. The Los Angeles boats are “the greatest nuclear predator, Soviet or American, ever to take to the seas,” wrote the editors of the Time-Life book, Hunters of the Deep. The improved Seawolf class will take the Navy into the 21st century. The Soviet Union’s sub fleet was developed to counter the U.S. threat. The Russians struggled for decades to match the quietness and speed of U.S. subs. They ran through a series of classes, Novembers, Alfas, Victors, Akulas and Sierras. By the late 1980s, the Soviets had reached near parity with U.S. boats. Aggressive U.S. patrolling was necessary particularly since the Soviets maintained a fleet of some 350 boats of all types. The U.S. had about 123 subs. Once both nations fielded SSBNs, assuring mutual annihilation, intelligence-gathering was paramount. Ascertaining the characteristics and capabilities of each country’s submarines became crucial to national security. U.S. subs began spying on the Soviets in May 1948, when the USS Sea Dog conducted reconnaissance patrols along the Siberian coast. The USS Blackfin picked up where Sea Dog left off. A decade later these missions were more daring and essential. In 1957, the USS Gudgeon, the first sub to circumnavigate the globe, was caught snooping around the Soviet naval base at Vladivostok inside Russian territorial waters. For 30 hours the sub was cornered and depth-charged by Russian destroyers. Gudgeon finally was forced to surface to restore its air supply. It came up ready to fight, but was allowed to withdraw. In May 1959, the USS Grenadier, off Iceland, detected, tracked and held down a Soviet sub until she was forced to surface. Operation Holystone, also known as Pinnacle, Bollard and Barnacle, was launched that same year. Its focus was intelligence-gathering. Sub commanders sometimes took extraordinary risks to obtain information on Soviet naval developments. In 1963, the USS Swordfish slipped into the middle of a Soviet anti-submarine warfare (ASW) exercise in the North Pacific. The Soviets depth-charged Swordfish for two days. But Swordfish was nuclear-powered and did not have to surface for air. Swordfish survived and the mission provided the U.S. with an intelligence bonanza as the Navy recorded the Soviet’s radio chatter and plotted their radar search patterns. For special operations conducted between 1963-65, Swordfish crewmen were awarded Navy unit commendations and the captain received the Legion of Merit. U.S. subs regularly took up station off Soviet ports to learn as much as possible about Soviet movements and capabilities. A favorite American tactic was to secretly shadow Soviet boats as they left port on a mission. “Some [subs] have passed less than 50 feet below the hulls of Soviet vessels to take photos of their propellers and tape the sound of the blades churning,” the Chicago Tribune reported. In 1969, the USS Lapon tailed a Soviet sub in the North Atlantic for 40 days without being detected. Lapon’s sonar operators became well acquainted with the daily sounds and habits on board the Soviet sub. They assigned nicknames to various Russian duty officers and could hear wrenches being dropped. Rumors persist that the USS Scorpion, lost near the Azores in May 1968, went down after colliding with a Soviet sub that may have been tailing the U.S. boat. In 1986, USS Augusta, an attack sub, ran into a Soviet nuclear sub in the North Atlantic while testing a new sonar system. In 1992, the USS Baton Rouge, collided off northern Russia’s Kola Inlet with another Soviet nuclear sub. “We knew the Soviets were out there, probably sometimes right beside us as we patrolled the vast areas of the Pacific,” says James Crenshaw who served on the SSBN John Marshall from 1976-80. By 1970, the U.S. developed submarines designed for complex espionage operations. USS Halibut, USS Seawolf and USS Parche were refitted to perform “special ops” missions in and around the Soviet Union. The missions were so secret and sensitive, said one former crewmember, that crews of the subs were segregated from each other on base and curtains were placed around the vessels while in port. To this day, sailors on those cruises are not allowed to speak about them. “I signed a paper that forbids me to talk about it for 80 years,” said one sub vet. Details of the Parche’s operations are classified, but special operations have earned the sub five Presidential Unit Citations and three Navy Unit Citations. But some aspects of the special ops missions are known. One of the most successful of these missions, code-named Ivy Bells, was the tapping of a vital Soviet undersea communications cable. The mission was carried out by USS Halibut, which crept into the Sea of Okhotsk, the bay separating the Kamchatka Peninsula from the Soviet mainland. Divers descended to the sea floor 400 feet below the surface to install a recording pod. Halibut and her sister special ops subs also carried robots that could explore the ocean floor. “We had capabilities similar to those used to find the Titanic,” one crewmember said. USS Seawolf and USS Parche also participated in recovering and replacing the recording device. According to one crewman, the subs would remain submerged on station for 30 days to record real time conversations, then leave the recording device behind for several months. The missions were so sensitive that at least one sub, Seawolf, was reportedly fitted with demolition charges fore and aft. If caught the crew would be given the option to leave the vessel before it was scuttled. “But with the water temperature at 28 degrees you’re not going to live very long, so you might as well stay with the ship and go down,” one crewman said. On one cruise, Seawolf released fouled air that bubbled to the surface. A Soviet cruiser streaked by the next day. “Everyone was sweating bullets, but we remained pretty well masked,” the crewmember recalled. Ivy Bells continued until 1981 when its cover was blown by a U.S. spy. The Russians also attempted to tap a U.S. undersea communication cable, apparently unsuccessfully. In 1985, U.S. spy satellites detected a Soviet sub loitering in a shallow part of the Atlantic. The Navy dispatched the attack sub USS Baltimore to secretly observe. The Russian sub launched a sled and divers who probed the seafloor 300 feet below. The waters were too murky for the Americans to determine the Soviets mission, but they were digging and drilling, presumably to locate an undersea cable. The mission was believed to have ended in failure and tragedy when the sled and divers failed to return to the Soviet boat. The most publicized U.S. intelligence- gathering action — secret for many years — was the raising of a Soviet missile firing sub that sank in the mid-Pacific on March 8, 1968. SOSUS picked up the sounds of the sub exploding and later Halibut, specially fitted with thrusters to enable it to sit motionless, located the wreckage using special cameras. Roger C. Dunham, a second class petty officer aboard the Halibut during the operation, wrote a fictionalized account in his book, Spy Sub. Cmdr. Clarence E. Moore, who skippered it, received the Distinguished Service Medal for his work. The deep sea salvage ship Glomar Explorer recovered all or part of the sub for evaluation by the Navy. It says the sub broke apart and only portions of its hull were raised. Some observers claim the entire vessel was retrieved. “Rumor is the Navy got what it wanted,” said one former submariner. The U.S. lost three subs during the Cold War. A fourth, USS Stickleback, sank after being rammed by destroyer Silverstein May 30, 1958, southeast of Pearl Harbor. All 82 crewmembers survived. USS Thresher went down 220 miles east of Boston in 8,400 feet of water with 112 crewmembers and 17 civilian workers aboard in April 1963. During search operations, Soviet “trawlers” passed through the area electronically sniffing for information. While Thresher’s loss was devastating to the Navy, her sinking lead to a thorough investigation uncovering numerous flaws in the sub construction program. Reforms may have saved other U.S. undersea vessels and their crews. Scorpion, with 99 men aboard, was lost 460 miles southwest of the Azores in 10,000 feet of water five years later. She had been assigned to Submarine Squadron 6, Division 62, with the 6th Fleet in the Mediterranean Sea. At least 16 other U.S. crewmembers aboard submarines were lost to accidents during Cold War operations. No comprehensive figures, however, are available dating back to the end of WWII. Some six Soviet subs are believed to have been lost. These include S-117, Dec. 15, 1952; K-129, March 8, 1968; K-8, April 12, 1974; and Komsomolets (42 died), April 7, 1989. An unidentified nuclear sub is believed to have been scuttled in April 1970, and a Charlie class boat sank off Kamchatka in September 1983. More Soviet subs may have been lost, unknown to U.S. intelligence or kept secret by both the Soviets and Americans. No one knows the number of Soviet submariners who lost their lives, but the presumed number is greater than U.S. losses. Only now are deserving submariners receiving medals for their service. 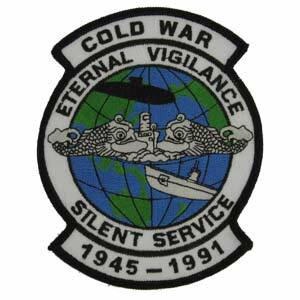 Along with their prized Dolphin submariner insignia, since 1969 they also have earned SSBN Deterrent Patrol pins. These patrols lasted 90-105 days, with 60-70 days continually submerged. The Navy Expeditionary Medal is also awarded to sailors who “operated under circumstances which after full consideration shall be deemed to merit special recognition.” This is the classic definition of sub intelligence-gathering operations. Individual decorations are even more guarded. Some received a “black” award: a medal that appears in the recipient’s service file folder but which he is unable to wear on his uniform. Sub missions have always been fraught with danger. In fact, President Theodore Roosevelt, after going down in the Plunger in Long Island Sound in 1905, ordered that enlisted men detailed to submarines be granted an extra $10 a month in hazardous duty pay. “Life aboard Cold War-era subs was austere,” remembers Senior Chief Sonarman Bob von Allmen, who served on the USS Growler, 1950-62. “Crews of 100 were crammed into small spaces for extended periods. Patrol lengths normally ran around 82 or 87 days. “The Halibut was nuclear-powered and it carried five missiles, but the other missile boats were diesel-electric with all the accompanying hardships. Diesel boat sailors were required to take sponge baths from a bucket.” VonAllmen justifiably remains proud of his special service.